Deck McGuire: Which Way Does He Go? 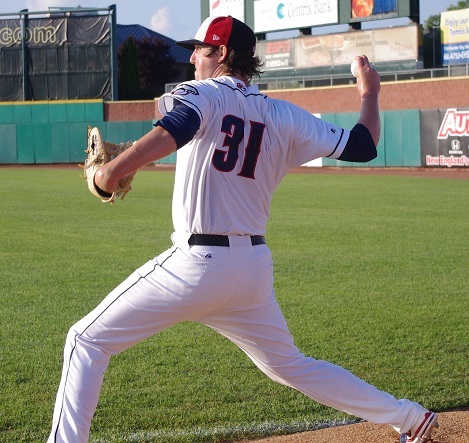 While in Manchester, New Hampshire on my trip to cover the Fisher Cats, I had a chance to see a pitcher that I’ve written about and been intrigued by over the past couple of years: Deck McGuire. Deck was the Blue Jays’ first round pick (11th overall) in the 2010 draft out of the Georgia Institute of Technology and made his debut in 2011 with high-A Dunedin Blue Jays in the Florida State League where he was absolutely dominant. The 6’6″ righty pitched 104 1/3 innings and struck out 102 batters (for a 23.2% rate) and posted an ERA of 2.75 and FIP of 3.63. 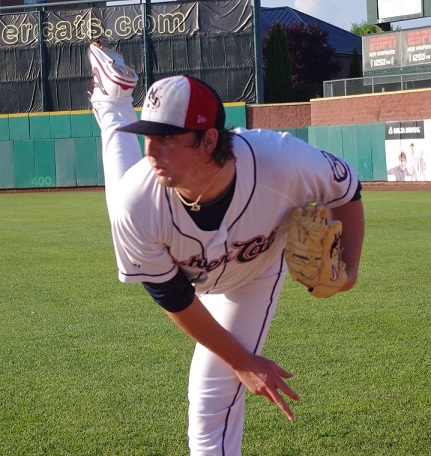 He was promoted at the end of the year to New Hampshire and pitched very well, upping his K% to 25% and lowering his walk rate to 8% in 20 2/3 innings. 2012 was a different story for Deck. 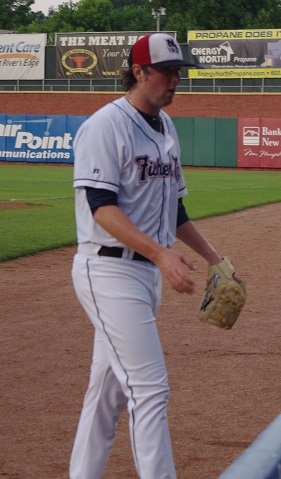 He had a rough year all around with the Fisher Cats, going 5-14 with a 5.88 ERA and a 5.26 FIP. He had a fairly average BABIP at .307 and regressed in walks (9.6%) and strikeouts (15.1%) over 144 innings in total. So far in 2013, Deck has been much better, but hasn’t found his consistency. After 16 starts, he’s 4-7 with a 5.42 ERA and 1.44 WHIP — not particularly great numbers at first glance. But if you look a little deeper, he has an FIP of 3.36, his BABIP is high at .332 (which indicates a lot of bad luck on his part). He’s also been striking out batters again, getting his percentage up to 21.4%, a very respectable number that represents almost one per inning for this season. So this weekend, I was finally able to set my eyes on the enigma of Deck McGuire. Scouts have said that they’re not impressed with the big Virginian but what I saw in Manchester told a different story. First let’s look at the numbers. Deck went 6 2/3 innings on Saturday, June 29, and gave up four runs on five hits (including a home run) and two walks and struck out 8. He threw 95 pitches (60 strikes) and was consistently getting ahead of his batters; he had first pitch strikes on 12 of 27 batters and went ball-one on 11 (four batters put the first pitch in play. Now, I did a little bit of number crunching here and found that when McGuire threw a first pitch strike (or got a foul ball) batters got on base 2 out of the 12 times. When he threw a first pitch ball, batters got on base 5 of the 11 times. Deck was also getting quite a few swinging strikes (we’ll get to that a little bit later) and his 8 strikeouts aren’t a fluke. As far as his repertoire goes, he was throwing his fastball consistently at 90-91 mph, touching 92 occasionally and his slider would come in between 83 and 85 with his changeup at around 82 mph. His curve was around 75-77 mph but he didn’t throw it that much, especially early in the game. It’s encouraging that his fastball velocity didn’t drop at all throughout the game and he actually struck out four of the last five batters he faced (three were swinging strikes). The velocities were all very consistent throughout the game showing the polished feel that he has for his pitches. To my eyes, his changeup was extremely effective. Watching from just a few rows up behind the plate, I couldn’t tell when the changeup was coming, showing excellent arm action from McGuire. It looked like there was some nice downwards movement on the pitch and it induced quite a few swings and misses. The fastball looked like it had some late motion on it, but for me, the changeup looked like his best pitch that night. 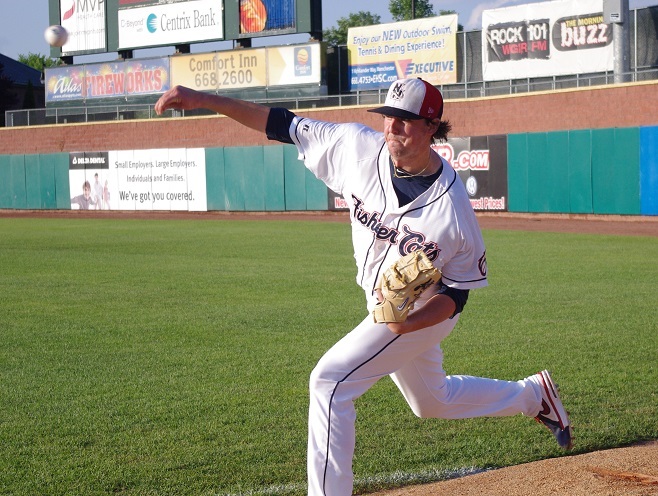 The next morning, I went in to talk to Tom Signore, the Fisher Cats’ pitching coach and we talked specifically about Deck’s game last night. He said that he was pleased overall with the performance, but that he tends to start worrying with runners on and can leave the ball up. Signore told me: “It’s been an overriding theme with his career. He’ll make a lot of good pitches during the game, but you can probably pick out five instances where he leaves a ball up and he gets hurt with it and it tends to happen with runners on base.” He also thought that Deck’s fastball command wasn’t as good as it has been but he had the other three pitches really working for him. He also thinks that McGuire should throw his changeup more: “I think he threw 17 changeups last night. I’d like to see him get into the 20s with that pitch because he got quite a few, i think 7 swings and misses with it and a ground ball to second. So I’d like to see him use that pitch more.” Signore also thinks that McGuire’s best pitch is actually his slider, a pitch that I didn’t notice him throwing too much that night (it’s possible that some of the pitches that may have looked like changeups to me were actually sliders). Basically, Signore confirmed for me what I had been seeing. His changeup was a really good pitch for him on Saturday and that there were times that he over-rotated and got out of his best delivery. What conclusions have I reached in getting to New Hampshire and seeing Deck McGuire in person? I think he’s better than the numbers suggest and that he could very well be a big league, back-of-the-rotation starter. He’s big and durable and doesn’t show a decline in velocity as he gets toward the 100-pitch mark in a game. He has a major-league average fastball with some movement on it (although the movement is a little inconsistent) as well as three other pitches that are close to major league average, if not there already. The quality of the pitches is there, but for McGuire, it’s about getting ahead of batters and being able to stay within his mechanics and execute pitches with runners on. If he can overcome his tendency to leave the ball up in high-leverage situations, he could definitely pitch in the majors. It’s far too early to call McGuire a bust. While the ceiling isn’t as high as a guy like Aaron Sanchez or Roberto Osuna, he also isn’t too far away from it with most of the issues being more mental than physical. The fact that his numbers below the surface are much better this year than last year shows that he’s definitely working towards making those adjustments. * A little side story here. I was sitting around a bunch of scouts and before the pitch that Thomas jacked out of the park, he was talking about watching Thomas take batting practice earlier and he hit to the Sam Adams sign that’s on top of the bar that’s beyond the left field fence. Thomas hit the next pitch in just about exactly the same place.